Robert Paterson's Weblog: Volcanoes and Food Production - Last Time Laki erupted French Revolution! Volcanoes and Food Production - Last Time Laki erupted French Revolution! Now what the picture is concerned about is that generally when Eyjaflallajokull erupts so does Kalta, which is right next door. But Katla is a larger system and the eruption is generally much more severe. Unfortunately what has also to be considered is that there are a whole line of craters, not shown on this map, between Katla and Vatnajokull, which are also a worry. Laki, an even greater threat than Katla, lies along this line. Iceland's Laki volcano erupted in 1783, freeing gases that turned into smog. The smog floated across the Jet Stream, changing weather patterns. Many died from gas poisoning in the British Isles. Crop production fell in western Europe. Famine spread. . . . . . . It is at the orange flag in this picture. 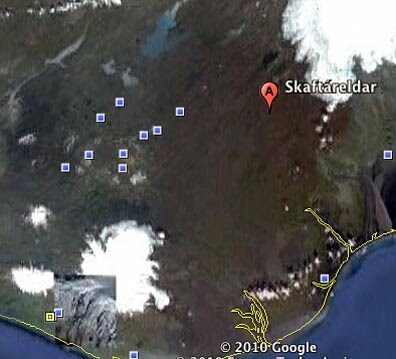 There is a line of eruption calderas from Katla up to Laki, which is up around Skaftareldar. The 3.5 earthquake I wrote about on Bit Tooth Energy lies beyond Laki on the line from Eyjaflallajokull, and was centered further north in the Vatnajokull. Some have blamed the weather created by the eight-month eruption of Laki as a possible contributory cause to the French Revolution. An eruption of that length, ejecting as much material as it may into the atmosphere, would have consequences that go beyond just the ability to survive the noxious gaseous clouds. At the moment the threat is to air travel and parts of life connected to that - but there is a major volcanic system involved here. If Laki goes - it's a new world for Europe. My point is not to be a doomsayer - but to make this point - our global economy ias based on the assumptions of our just in time system working perfectly - it can't and will not. Time to plan for more local resiliency and for more diversity.